I picked up this children's adirondak chair at a garage sale for $3. It had seen a Montana winter or two and was peeling and weathered. After a little sanding and primer, I painted 'er up. 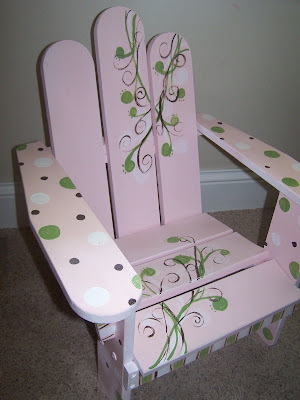 I think I want a grown-up princess chair like this. 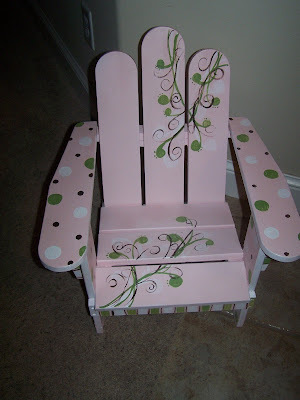 Oh Bec, when I started to read this post, I was thinking how gorgeous a chippy adirondak chair would look, but after seeing it painted in your trademark style, it is adorable, I love it! I dont think you will have a problem selling it, though Id want to keep it! You made it so pretty! Wow, it is beautiful! You are very talented. Love all the flourishes! So cute! That is gorgeous!!! Polka dots are my favorite - and you did 'em just right! It's fit for a princess! This is SOOOOO cute! I love it! How absolutely cute! I love it. Great job - you are so very talented! great job! i know a couple of little girls that would be thrilled to have that!!! That is absolutely gorgeous! I love that chair! Wish i could have one too! Great job! What a great chair!!!! Great paint job!!!!! Oh my goodness....it looks fantastic! I love it! This is so very adorable! You should paint more of these. How Funky Is Your Checkers?